The green card, which only recently became green again, has a history with a variety of names and colors. U.S. Citizenship and Immigration Services (USCIS) officially refers to it as the Permanent Resident Card. However, it has also been known over time as a Resident Alien Card or Alien Registration Receipt Card. You may even notice that USCIS labels it as Form I-551. In fact, the history of the green card is very colorful. It wasn’t until 1940 that foreign nationals were even required to register within the United States. The Alien Registration Act of 1940 required that all aliens (non-U.S. citizens) within the U.S. register with the federal government at post offices. The registration forms were forwarded to the Immigration and Naturalization Service (INS) for processing, and a receipt card (Form AR-3) was mailed to each registrant as proof of compliance with the law. The law did not discriminate between legal and illegal alien residents. All aliens had to register, and all received AR-3s. 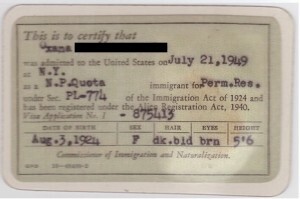 The first green card emerged soon after World War II. Congress enacted the Alien Registration Act of 1940, which required foreign-born persons 14 years of age and older to report to a U.S. post office to be fingerprinted and register their presence in the United States. As immigrants began streaming through U.S. borders, alien registration ceased to take place at post offices and became part of regular immigration procedures at ports of entry and immigration offices. Immigrants with no legal basis to remain in the United States were required to leave or were removed. Those with a valid claim to permanent residency received documentation to prove their status. 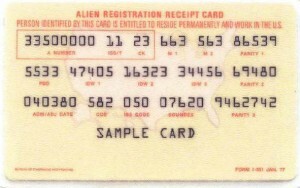 INS began to issue different documents based on the alien’s admission status to replace the receipt cards. 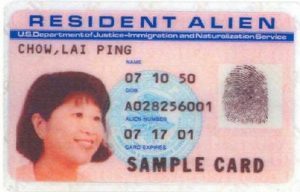 For example, visitors received an I-94c, temporary foreign laborers received an I-100a, and lawful permanent residents (LPRs) received an I-151. The pale green colored Form I-151 became coveted proof that the holder was entitled to live and work indefinitely in the United States. The Internal Security Act of 1950 increased the value of Form I-151, Alien Registration Receipt Card. Effective April 17, 1951, aliens holding AR-3 cards could replace them with a new Form I-151. However, only those with legal status could replace their AR-3. What’s more, aliens who could not prove their legal admission into the United States were subject to prosecution for violating U.S. immigration laws. As the desire to immigrate to the United States grew, so did the value of the green card. 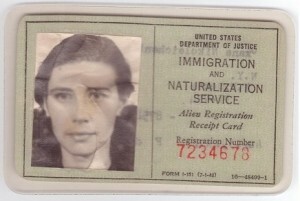 By the 1950s, INS was burdened with the problem of counterfeit green cards. To combat document fraud, the INS issued 17 different re-designs of the card between 1952 and 1977. 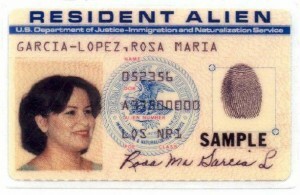 A more counterfeit-resistant version of the green card was developed in 1977. The newer, machine-verifiable green card was produced only in a Texas facility to improve uniformity and quality. The formerly paper cards were now made durable like credit cards and driver licenses. A fingerprint, signature and A-number were added as additional identification measures. 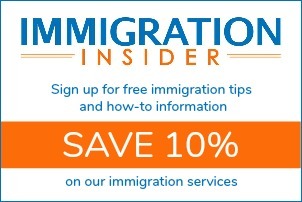 INS renamed it with its current form number, Form I-551, and adopted a new name, “Resident Alien Card.” Cards issued between 1977 and August 1989 do not have document numbers or expiration dates and are valid indefinitely. However employers found it difficult to verify identity because of the various versions of the green card. So INS once again issued a new card version in August 1989. These peach-colored cards contain expiration dates, but do not have document numbers and have since expired. 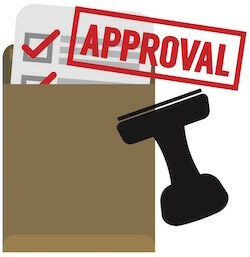 To further combat document fraud, effective March 20, 1996, the old Form I-151 Green Cards issued prior to 1979, became obsolete. 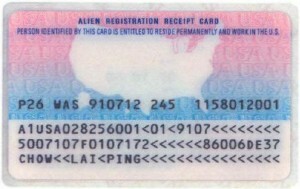 The Form I-551 Alien Registration Receipt Card became the only valid green card. As quickly as INS worked to counter fraud, counterfeiters caught up. Thus, a more secure card was developed and issued in December 1997. 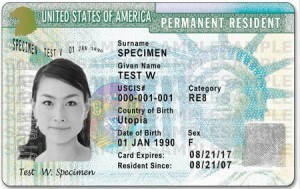 The revised card bared a new name, “Permanent Resident Card,” but retained the Form I-551 number. 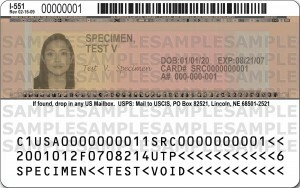 A unique document number (also known as a card number) was also added to the card. In May 2004, the design was modified slightly with the Department of Homeland Security seal and a detailed hologram on the front of the card. 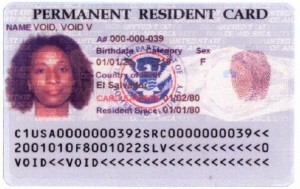 A large number of permanent residents continue to carry this version of the card. The last cards will expire in 2020. 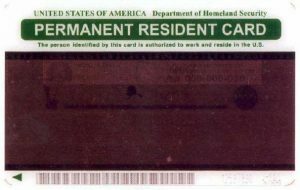 The current version of the green card was introduced in May 2010 and features security technologies such as holographic images, laser engraved fingerprints, high-resolution micro-images, and radio frequency identification (RFID). For detailed information about these security features read How to Read a Green Card. People gathering information on family history (genealogical research) can obtain many of these early alien registration records from the U.S. government. These records are available through the Freedom of Information Act/Privacy Act.